Last week, I recommended downloading population registers from the 1900s while you can. 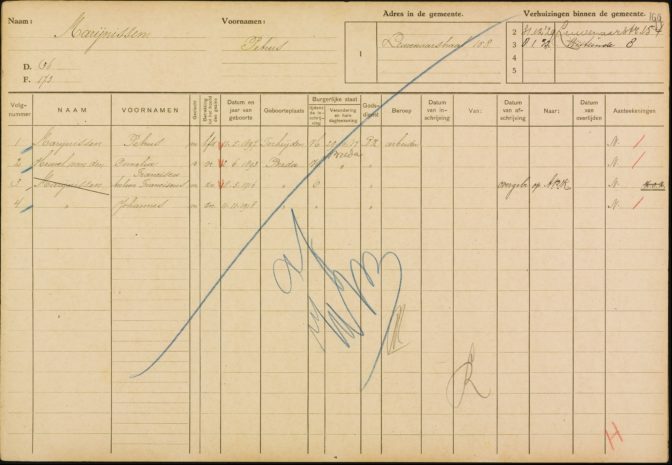 This week, the Vereniging van Nederlandse Gemeentes [Society of Municipalities in the Netherlands] issued an official recommendation to archives and municipalities to take the family cards for the period 1921-1940 offline, followed by the advice of the archives association BRAIN to limit the public availability of these records to 110 years, so my advice is even more urgent now. These cards are part of the population registration and are an important source of information for research in the 1900s. They contain names, dates, addresses, and religion. Religion is a special type of personal data under Dutch privacy laws, and especially under the new AVG data protection law that will go into effect in May 2018. There is insufficient basis to share that information online. The VNG’s recommendations act as guidance for municipalities and ensure that interpretation of laws do not differ depending on the municipality. This makes it likely that most municipalities will choose to take the family cards offline. To have a legal basis for restricting access, the archives association BRAIN is recommending the archives not just take the scans down, but restrict access for these records that are less than 100 years old. That means that you won’t even be able to see them in the archives anymore unless you can prove that all the people are deceased or you have their permission. To see if there are family cards available for your family, you can go to the Digital Resources Netherlands and Belgium website. Click on the internet link beneath the province and search the page (Ctrl-F or Command-F) for the town where your ancestors lived. They could be listed as “gezinskaarten” [family cards] or “bevolkingsregister” [population register]. Not all places have digitized these cards, so it’s possible they have never been online. If they are still online, get your ancestors’ cards NOW. Ik kan me niet aan de indruk onttrekken dat dit een zwaar overtrokken reactie is. Is er ooit wel eens misbruik van dit soort gegevens gemaakt (door genealogen)? Ik zou het een stuk prettiger vinden indien onze overheid zich druk zou maken over bv. de komende PSD2-wetgeving (https://www.nrc.nl/nieuws/2018/02/14/er-zit-nog-wel-een-schoonheidsfoutje-in-psd2-a1592118) waarbij derden compleet inzicht kunnen krijgen in ons aller bankrekeningen en betaalgedrag, zelfs indien je daar geen toestemming voor geeft. Als ik het goed begrijp moet relevante wetgeving de Tweede, en dus ook de Eerste Kamer nog passeren maar de VNG moet weer zo nodig voor de muziek uitlopen.